Not good at Photoshop? Not an issue, there are number of online services to play with images with few simple mouse clicks resulting into really good and professional looking results. Till now you have seen: Reflection Maker, FlauntR, Enlage image retaining quality, MagCover image maker, fixpicture and software to create text/image animation. Here comes another one for creating 3D boxes online. Concept and procedure is really easy, just browse the photos you want to appear on the 3 visible sides of a 3-DÃ‚Â box and click on ‘Create 3-D box’. 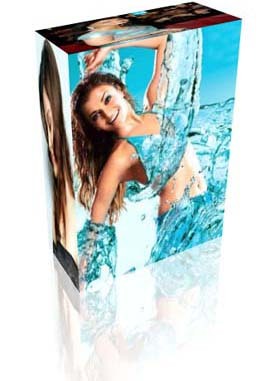 Here is 3-D box that I createdÃ‚Â with images of Star ‘Aishwarya Rai’. You will be amazed at the quality of the output. You can alsoÃ‚Â flip the images for final placement, after that save the output in either JPG/PNG/GIF format. Very easy and quick without theÃ‚Â usual bells and whistles of an online image editor. You can also see images of 3-D boxes already created by users. While I used it for some fun with images, this can be of very good use to some. Software developers, products manufacturers and many more can use this tool to make cover boxes to advertise their products, what say?